and relations to service members for non-service member passengers was recorded. Riley Wright (1893-1919) (spelled Reilly) (line 92) is listed as part of Company L in the 807th Pioneer Infantry leaving Hoboken, New Jersey for France. Their ship departed on September 15, 1918. Wright's serial number is 4185983 and his wife, Eva, is his emergency contact. Riley Wright was born in 1893 (though some of his documents list his birth year as 1895) around Falmouth in Suwannee County in northern Florida, one of five children. Like his father and grandfather before him, Wright worked as a farmer, a common occupation of African American men in the rural South. He married Eva Coleman on April 15, 1917, and was drafted on August 3, 1918. He joined the 807th Pioneer Infantry unit, one of sixteen established. In France, Wright and his unit worked in a technical capacity: they constructed and repaired roads, bridges, and railways. Though the Army did not consider these infantry units as combat units, their work on the front lines brought them in direct contact with the enemy. The 807th participated in the Meuse-Argonne Offensive, the last major engagement of the war. Wright survived the offensive. However, he succumbed to disease on January 7, 1919. The influenza killed a great many soldiers as well as civilians in the outbreak of 1918-1919, though the mortality rate of black soldiers such as Wright was often higher than that of white soldiers because of discriminatory white doctors. 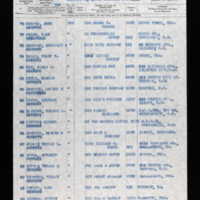 Digital reproduction of original passenger list: Records of the Office of the Quartermaster General, 1774-1985, Record Group Number 92, Roll or Box Number 578. "." Online database with images, Ancestry.com. Accessed July 23, 2018. https://search.ancestry.com/search/db.aspx?dbid=61174. Office of the Quartermaster General. 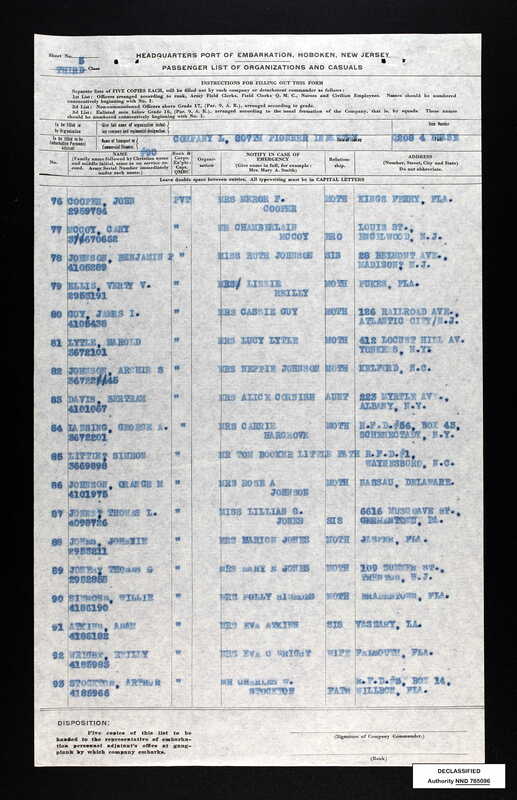 “Passenger List, 1918.” RICHES of Central Florida accessed April 21, 2019, https://richesmi.cah.ucf.edu/omeka/items/show/10382.